West Dundee’s spectacular community festival Heritage Fest is set for Friday, Sept. 14, through Sunday, Sept. 16. While relatively few street closures are needed to facilitate the event, there are potential impacts to area residents and motorists. Lincoln Avenue, North First Street and the 100 block of Washington Street will be closed Friday morning through Sunday evening. South Second Street from Main Street to Liberty Street will be closed from about 6:30 a.m. to 5 p.m. Saturday and Sunday. See 2018 Community Events Schedule & Impacts at wdundee.org for more information. East Dundee bowed out of the event this year, so there will be no street closures there. Whether you come out for the bands, the Friday-night fireworks, the food and drink with friends, the expansive Arts & Crafts Fair or the Antique Market, to see the Cool Car Show, the super fun kids activities, the Pancake Breakfast or any of the many other offerings and activities, Heritage Fest is a great place to come together and enjoy our community. Visit www.wdundeeheritagefest.org for details and a complete Schedule of Band & Events and the Heritage Fest Kids Guide. For many, their favorite part of Heritage Fest is volunteering alongside friends and neighbors. Its a great way to get to know some of the hardest working and most fun people in our community! There are still numerous shifts open, and we need YOU. Assistance is primarily sought for beverage sales & service, in 2-3 hour shifts, along with opportunities to assist with the Lions Heritage Fest 5K. To view and sign up for available shifts, please visit the Volunteer Sign-Up page at wdundeeheritagefest.org. Student volunteers in need of service hours are welcome to assist with pop/water sales! 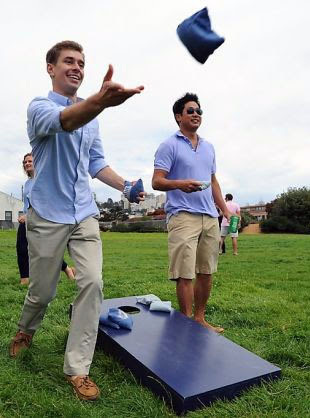 Show off your backyard bags skills in the Heritage Fest double elimination Baggo Tournament! Tournament play will be held in Grafelman Park on Saturday, Sept.15. Check in begins at noon, tournament play begins at 12:30 p.m. Registration is limited to 20 teams. Visit the Baggo Tournament page at wdundeeheritagefest.org for a registration form. The Dundee Township and Elgin Lions Clubs are co-sponsoring a 5K run and 1.6 mile walk beginning in West Dundee and along the bike path in East Dundee at 8 a.m. Saturday, Sept. 15. Proceeds support local charities as well as fulfilling eyeglass needs for children in both District 300 and U-46. For more details, visit LionsHeritageFest5K.com. Register online in advance and save $5!